GUATEMALA CITY, Guatemala – Trinidad & Tobago opened its qualifying campaign for the 2018 FIFA World Cup with a 2-1 win over host Guatemala on Friday at the Estadio Mateo Flores. Second-half strikes from the European-based duo of Khaleem Hyland and Kenwyne Jones gave the Caribbean power a two-goal advantage, before Carlos Mejia pulled one back in stoppage time. The first night of fourth-round, Group C play started earlier in the evening with the United States defeating St. Vincent & the Grenadines, 6-1. 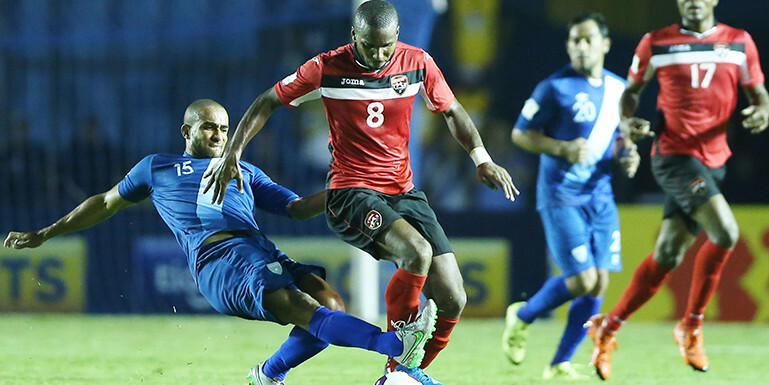 T&T will welcome the U.S. to Port of Spain on Tuesday in an early top-of-the table clash. Hyland gave the Soca Warriors a 1-0 lead in the 65th minute, collecting a pass on the left and unleashing an effort from beyond the 18-yard box that skipped past diving Guatemala goalkeeper Paulo Motta. It was the 26-year-old’s fourth career international goal and his first since netting against Honduras in a World Cup qualifier on March 28, 2009. In the 81st minute, Kenwyne Jones connected on a Joevin Jones feed to double the visitor’s advantage. Capitalizing on space down the left for much of the night, Joevin Jones attracted the attention of five converging Guatemalan defenders. The speedy Chicago Fire winger played a precise ball into the area for the unmarked Kenwyne Jones to volley home. Mejia sparked a rally in the first minute of stoppage time. After picking up an errant ball on the T&T touch line, Guatemala captain Carlos Ruiz produced a deft touch on the cross that found Mejia amongst a crowd of defenders. The substitute dutifully knocked his shot out of the reach of goalkeeper Jan-Michael Williams and goal-line stationed defender Radanfah Abu Bakr to make it 2-1. Guatemala, which will visit St. Vincent & the Grenadines on Tuesday, also fell to Trinidad, 3-1, in July’s CONCACAF Gold Cup.